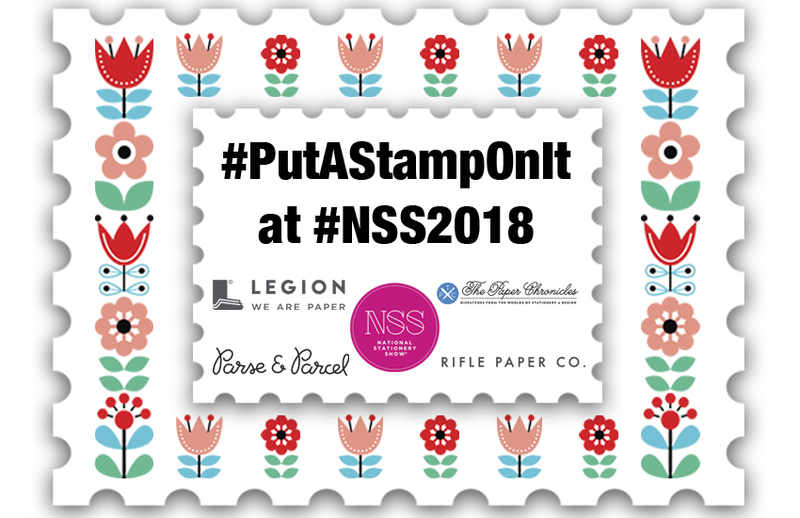 Calling all National Stationery Show ’18 exhibitors: Legion Paper invites you to put your own special stamp on this year’s show! Put your design skills to work and design a postage stamp representing your work and brand. Just 25 lucky exhibitors will have their work chosen to be included in a special commemorative box designed by industry icon Anna Bond of Rifle Paper Co.! 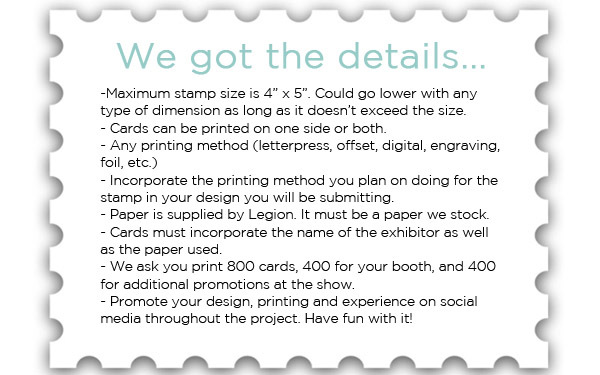 This one-of-a-kind set will be promoted leading up to the show by National Stationery Show, Legion Paper, The Paper Chronicles, Parse & Parcel — and you! As always, collecting stamps will help drive traffic to booths and build buzz around participating brands. And speaking of printing, we are seeking submissions that pull out all the stops — foiling, die-cutting, embossing, letterpress, engraving. Get some inspiration here. Finalists will be promoted before the show in blogs, social media and email communications by NSS, Legion Paper, Parse & Parcel and The Paper Chronicles (combined IG followers: 69K+), with print coverage planned in Stationery Trends as well. At the Show, your card will be displayed at the NSS show as well as an informal walking tour led by Sarah Schwartz. The complete sets will be sent out after the show for further promotion about the entire project and featured though influential leaders. Apply with your design, design specs, printing techniques as well what type of paper you think will work with your design. Those selected for the project will get samples of papers they’re interested in, as well as the paper they need to print 800 stamps. Hurry — design concepts deadline is Feb. 7, 2018! Interested? To apply to be one of the 25 participants, fill out the application below and send your design by Feb. 7, 2018 to sarahs@greatamericanpublish.com and Paige@legionpaper.com.